Did you know that the average person looks at their phone at least 100 times a day? That’s at least 100 chances to scroll through Facebook, Instagram, or watch a quick YouTube video. As a business owner or marketer, your advertising content has to be better than ever: quick, easily accessible, and enjoyable for your audience. Furthermore, a recent study of marketing industry statistics showed that 51% of marketers feel like video advertising creates a bigger return on investment than any other form of marketing. If you choose to utilize this vastly versatile medium to sell your product, be wary, while the average person may have 100 chances in a day to see your content, they also have 100 chances to turn your video off. 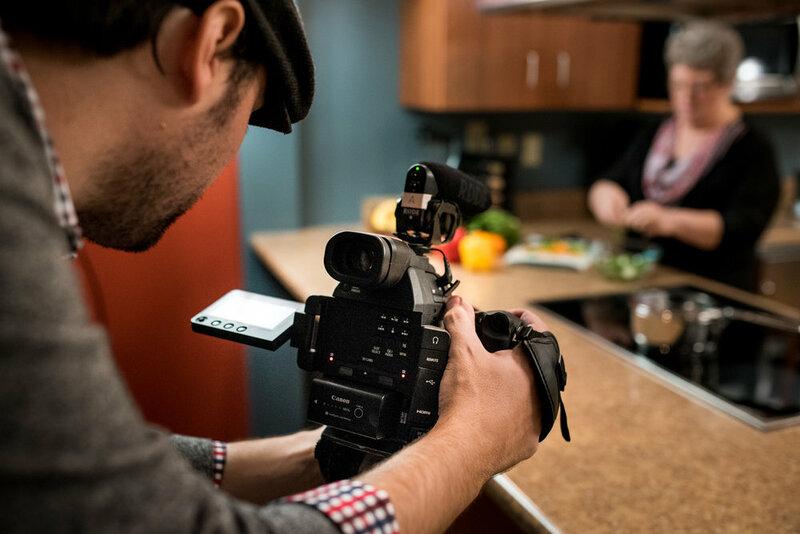 Be sure to answer these five questions when making a video marketing campaign so that you engage your audience and keep their thumb away from the screen. Does it sound good? Think of what you’ve seen on the news lately: vertical, hard to see cell phone videos, grainy cats playing with toys, etc. Your general audience will not close a screen just because the overall video quality is bad. They can stand to watch a poorly shot video if it’s something they’re interested in. What will get your audience to tune out and turn off is bad audio. If your music is too loud or the audio is distorted, you will instantly lose your audience. Make sure your sound is on point before giving your video advertising to the world. Have they heard this all before? Our brains have evolved to ignore overused words and phrases. This is how concepts like ‘fake news’ grow cold in the media so fast. If you hear the phrase from every media outlet, your brain stops wanting to process it. Keeping your content fresh can be the difference between life and death for your marketing campaign. We put a lot of emphasis on storytelling because the way you tell your business’ story matters. People want to hear something new. How are your visuals? This one seems straightforward, but people spend hours debating Easter egg theories about popular TV shows just by the way images are captured in a frame. Composition matters and should have purpose. Your viewer should feel continuity and intention in what you’re showing them on screen. Don’t have a subject too close to the edge, or looking too far out of frame. Your audience will feel that something is not right and stop watching. Did you hook them before you tried to reel them in? Most people make a decision within 7-10 seconds of starting a video as to whether they are going to keep watching or not. That is a short amount of time to get your point across to your viewer and to keep them engaged. By placing a hook in the first few seconds of your video, you are ensuring that your viewer has a reason to stick around and watch your story until the end. Can your viewer feel it? Last, but certainly not least, your viewer should sense the passion you have for whatever it is you are showing them on screen. The point of telling a story is to engage on an emotional level with your audience. Don’t sell them short by showing them a story that you and your brand do not feel connected to. Take the time to make something truly special and your audience will keep coming back for more. On your next project, keep these five questions in mind. Or, better yet, contact us! We would love to start a journey with you to tell the story of your brand alongside you. In the meantime, keep your thumb away from that pause button. You might like what you see. Great storytelling is a science made up of several different components. Each of these components is important in its own right- production value, emotional connections, character development- the list goes on. All of these parts of a great story should work together to do one thing in particular: cause the person who is receiving the story to lose himself in it. Or, in other words, to be transported into the story. You may have heard us mention this before (winky face), but this concept is called narrative transportation. And there’s a whole bunch of theory behind it. You can change people’s minds. In today’s culture where has opinions on Facebook and Twitter, it almost seems impossible that anyone is able to change anyone’s mind. According to narrative transportation theory, a good story can do just that. Or as Melanie Green states in her book, “when consumers lose themselves in a story, their attitudes and intentions change to reflect that story.” The caveat here is that (in our case) your viewer has to truly lose themselves in your story. Which means that you have to employ all of the different aspects of storytelling in order to give your viewer places to access your story. This means that emotion, character, location, and purpose are all tantamount to giving your viewer a reason to care. And care inspires action, according to narrative transportation theory. You can bring people into your world. If you are a small business owner, chances are your company is your livelihood, which means it really matters to you. If you are in charge of a large company, you are probably responsible for many people’s livelihoods, which means your company really matters to you. By employing narrative transportation theory, you are allowing outside customers and consumers a window into something that matters to you and your employees deeply: their occupation. By telling a good story, you can allow your intended audience into your business in a way that they would not be able to otherwise. This can achieve repeat business, longstanding relationships, and a sense of ownership by your customer base. And all of these things are accomplished by telling a good story. In all of our projects, we strive to tell stories that transport their viewership into them on a deep and meaningful level. We want to engage people in such a way that they want to learn more about a brand because they care about it and identify with it. Let us work with you today to start telling a better story for your company. Purpose- to reduce the idea of capital ‘P’ purpose down to its most basic parts, you could say that the overarching Purpose of commissioning a video for your business is advertising and brand recognition. More specifically, the Purpose of a branded video (whether it be for internal or external purposes) is to lead your viewers or clients to a decision that you want them to make. purpose- the lowercase ‘p’ purpose is a bit more conceptual than the capital ‘P’ Purpose. When we talk about purpose in a video spot, we are talking about all the microscopic and macroscopic decisions that go into making a truly compelling video. These decisions include choosing to combine the elements of character, emotions, and location. It also includes lighting choices, camera choices, angles, and all the other elements of filmmaking that give a specific video purpose. What do these two things have to do with production value, you might ask? Production value falls somewhere in between these two definitions of purpose. It serves the capital ‘P’ Purpose, because production value is deeply tied to narrative transportation (a topic we will cover in depth next week). Narrative transportation is the ability to transport your viewer into a story and make them feel like they are a part of it. This serves the Purpose of giving your viewer a clear in-road to the story you are trying to tell, so that you can lead them to decision that you want them to make. Production Value /n/: The combined technical qualities of the methods, materials, or on-set staging skills used in the production of a motion picture or artistic performance. Because the purpose of a video is all of the combined choices that we make on a set to better tell a story, production value falls under that category. 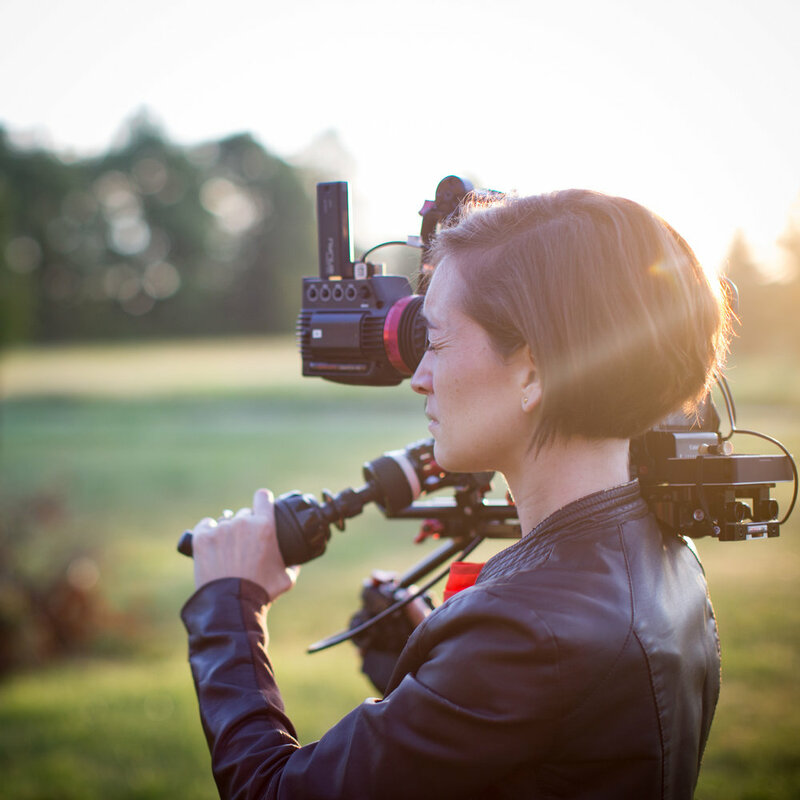 The types of cameras we use, the lighting, whether we follow a person throughout their day, or shoot them sitting alone and telling their story one on one, all contribute to how a video looks and feels. These elements of production value all add to the aforementioned theory of narrative transportation and how active your viewer feels in the story they are watching. Accessibility: When we worked with Carolinas Healthcare, there were certain parts of the ER Nurses’ days that we wanted to capture, but we were not allowed the access. 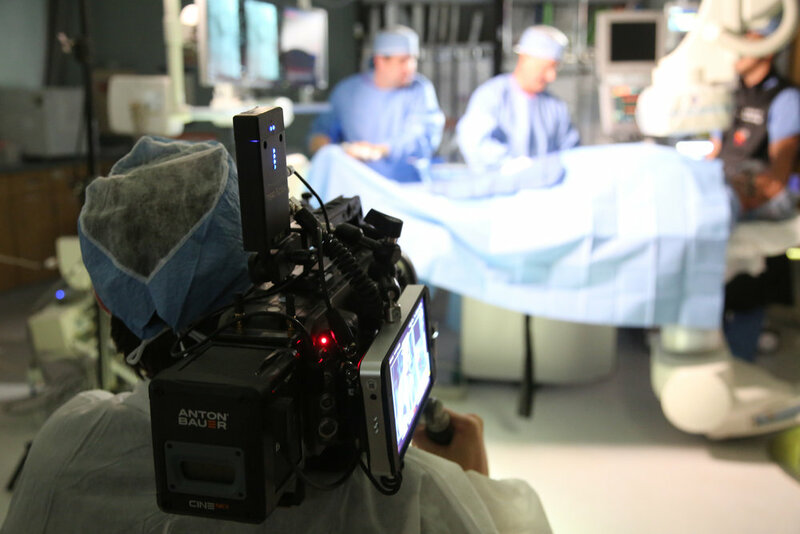 Meaning: you can’t set up a large video set in the middle of an operating room. We wanted viewers of the video to really understand what a day in the life of an emergency room nurse was like, and felt it was important to the Purpose of the video. So, we put GoPro cameras on some of the nurses and used that footage to show how intense their days can be. Feeling: Not every story is heavy, or dark, or emotional. By adding a glossy sheen to every video shoot, you remove some of the reality within the story you are trying to tell. Take our shoot with Mat Marrash and his camera. We shot that entire video on a Canon DSLR camera, because we wanted it to feel real. If we were out in the woods with Mat with a large set and tons of equipment, you wouldn’t get the sense that you were experiencing what he’s experiencing when he’s photographing landscapes. Narrative Transportation: There it is again, this beautiful concept! Recently, we talked to a school about having the students shoot the majority of the video we used for their shoot on their iPhones. We pitched this idea because it most accurately reflects the way the students at the school experience the world- through the cameras on their smart phones. By using those cameras, we are able to take the viewer into the world of the students and put them there. Which serves a large purpose. No matter what your project is, the production value matters to the story that you and your brand want to tell. Contact us today to see how we can help you tell the best narrative for your business that will reach the most people effectively. Stay tuned next week for more thoughts on narrative transportation, and why we believe this is one of the most critical element to an effective video and is most often overlooked. Emotional Decision Making? This is How We Do It. So reader, how are you feeling? Over the past few weeks, we’ve talked about how emotions affect decision making. We have talked about the neuroscience of what the loss of emotions can do to your brain, and how emotions affect your decisions, even economically. Today, we want to dip into something a little bit more practical. We want to explain how we use these ideas when we make videos for a clients in order to draw viewers in with emotions and then present them with the data they need in order to make a decision. And we genuinely hope that all this talk about emotions is giving you the feels. It is for sure giving us the feels. In our aforementioned blog post about emotional decision making, we talked about Charlotte Falk and her decision to attend the Columbus School for Girls. (If you want to read more about that story, click here.) The reason why we focused on Charlotte’s story in that particular blog post is that it is a very good example of how the emotional argument can often outweigh the statistical argument. Sure, CSG has all of the numbers to support the success of their graduates (SAT scores, college enrollment statistics, etc.). But when we began thinking about what a mother and father would want to see in terms of their daughter’s future, we realized that they would want to see how happy, thriving, and engaged their child could be if she were enrolled at Columbus School for Girls. We realized that appealing to the emotions of the prospective students and parents was the most important thing, because most parents just want to be sure that their child is happy. A few months ago we talked about Melinda’s story when we broke down the science behind storytelling and focused on emotions. When Mercy Health approached us to do a series of videos for them, they asked us to help them with internal employee engagement. The Purpose of Melinda’s story was to highlight how much of a difference Mercy Health employees make when they do their jobs. From a practical standpoint, it would have been easy to make a video outlining the statistical advantages of working for Mercy Health. To show the benefits provided by the company, the number of people that the hospital helps on a yearly basis, etc. Instead, we made a video outlining Melinda’s experience of working in hospice care and standing by people’s bedsides as they pass on from this world. Why did we do this? Because it is one thing to give a presentation about why an employee’s job matters. It’s a completely different thing to show that job mattering in real time. With Melinda’s story, that’s what we tried to do. If you only knew the most basic information about Eleventh Candle Company- that they are a company that sells candles to help support women in Ethiopia- what kind of video would you like to see explaining their mission? Amber Runyon, the founder of the company, has all of the statistics relating to how the sale of candles benefits the people of Ethiopia and how they are reaching out to make a difference.. Instead of showing all of that, we decide to make a video in the streets of Ethiopia, following Amber through a normal day. By allowing the viewer to actually see the people they are helping, it plays to the emotional argument that the story Amber is important and worth supporting. Every video we make, whether it’s following a man with his large format camera into the woods for a day, or telling the story of a man with Multiple Myeloma, we want to find the emotion in the story first and then show the statistical, rational part second. If you choose to partner with us at Rooted Content on your next video marketing campaign, we can guarantee that we will work with you to find the heart of your story. Because most of the time we act with our hearts, and that’s a beautiful thing.